Join us in congratulating Tom Griffiths! 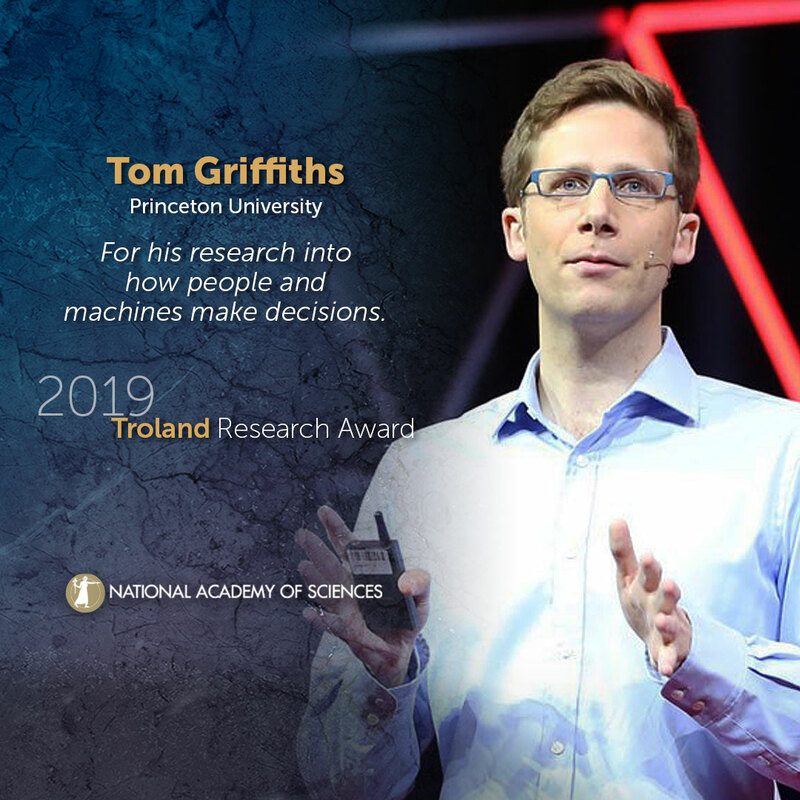 Tom Griffiths, Princeton University, will receive a 2019 Troland Research Award. Griffiths’ research focuses on a key question: “How do people make decisions?” The work combines behavioral and computer science to provide a greater understanding of both human cognition and machine learning. Griffiths uses Bayesian inference, a method of statistics that is used to determine probability, to predict how people make judgements and decisions in uncertain situations. The work examines and characterizes both optimal decision-making as well as why people make decisions that deviate from the optimal. The research helps to address human behavior and the psychological processes underlying such critical functions as problem solving, reasoning, learning language and the perception of coincidence. As part of his research, Griffiths has also pioneered new methods of online experimentation that overcome limitations in traditional research models, including a set of open-source tools. He has also explored how massive corporate datasets—such as which songs people listen to, or books they read—can be used to study and test new theories of decision-making behavior. In the relatively short time period of his career to date, Griffiths has published more than 200 influential papers as well as the book "Algorithms to Live By: The Computer Science of Human Decisions," which was named one of the best science books of 2016. He remains one of the most groundbreaking researchers in the fields of cognitive and computer science. Please use the following sample social media posts and other materials to congratulate Tom Griffiths.